As explain in an earlier post, the tennis string market has gone through some significant changes in the last few years. It wasn’t long ago that Natural Gut reigned supreme as the top choice (if you could afford it) for players of all levels. Virtually all pro’s on tour had variations of “Gut” in their frames to achieve great ball feel. Today, there has been a great shift towards the newest string composition: Polyester. Recent polyester strings offer offer supreme ball control at high swing velocities along with great durability. Looking even further, “textured” polyester strings are currently in the tennis equipment lime light as they provide all the benefits of regular polyesters with added ball bite and spin. 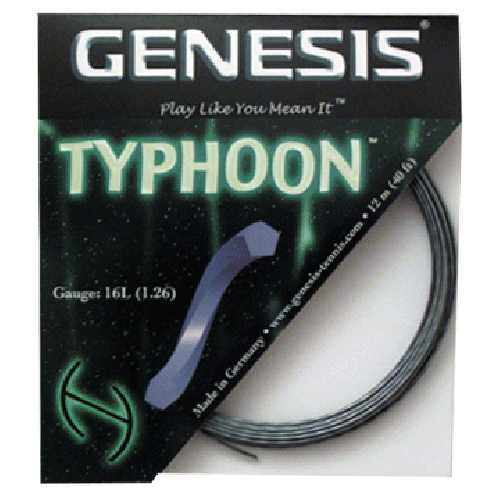 Two such recently released textured polyester strings that reign at the top of their class are Genesis’ Spin X and Signum Pro’s Tornado. Let me preface my review of these strings by stating that they are two of the most advanced 3rd generation polyester strings on the market; players can’t go wrong with either string in their racquets. That said, there are some subtle differences that can help you decide which string better suits your individual game style and needs. Genesis is a relatively new string brand that hit the ground running as they initially released Spin X as their “flagship” string. During stringing, Spin X is resistant to kinking and lacks extreme coil memory which makes for easy installation. The construction method Spin X is a very sophisticated process that allows the already octagonally textured string to be twisted around the axis. From a playing perspective, the string provides great access to spin with its rough and twisted surface. I was able to achieve great ball bite for heavy topspin while maintain pinpoint control over shot location, especially at high swing speeds. Volleys are crisp and “plow through” is still substantial, something textured strings can often lack. Spin X is also less resistant to string notching and after an initial break-in period holds playing characteristics until it breaks. This is Signum Pro’s new flagship string that continues a tradition of great polyesters from this company. Signum Pro’s previous strings (such as the entire Poly Plasma Line) are known to provide great tension maintenance and a consistent string bed right off of the stringing machine. Tornado continues with these characteristics, and adds great access to spin with its textured / twisted surface and substantial power for a polyester string. Installation is slightly more tedious than Spin X as Tornado has a rougher texture; this shows up as an added benefit on the court with extreme amounts of ball bite. Where Spin X blends control and spin, Tornado is a mixture of power and spin – so much so that I would recommend stinging 2-3 pounds tighter to help offset the “pop” off the string bed. On court I was able to hit very heavy topspin shots off both sides, and my slice shots stayed low and dug into the court on the other side. My kick serve jumped up like never before, often forcing my opponents to hit returns above their shoulders. This added spin does come with a couple downsides, in that I found it difficult to flatten out my strokes at times as the extra texture likes to really bite into the ball. Also, Tornado played extremely well in my racquet from the start, but after some time began to notch and lose its playing characteristics. All in all, both strings are great choices for those looking to break into the world of textured polyester strings. The best way is to truly give them a try yourself and see which one better suits your game style. Signum Pro Tornado & Signum Pro Hyperion Now In Stock! Signum Pro’s latest string offerings, Tornado and Hyperion are now available in both sets and reels. The Tennis Depot is the first retailer in the U.S to have both the Signum Pro Tornado and Hyperion available in both 40’ sets and 660’ reels. Tornado is a heptagonal-shaped co-polyester string offering a high level of dynamic power while offering exceptional access to spin. 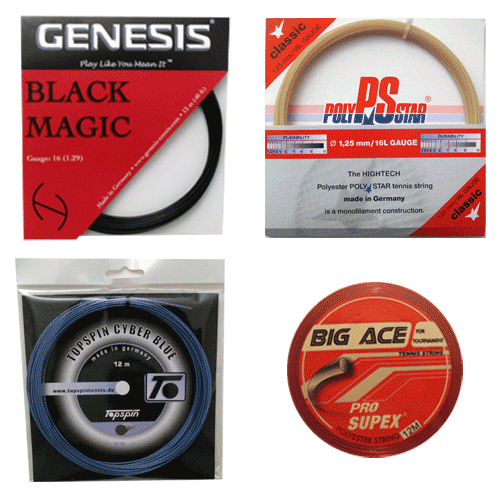 This string is axially twisted and greatly increases the spin potential when compared to traditional round strings. Signum Pro Tornado also offers excellent playability and comfort for a co-polyester string. This next generation string offers a new optimized molecular structure which in result makes the Tornado hold tension remarkably well. Hyperion offers a new optimized molecular structure offering outstanding power along with an incredible level of playability and comfort. Signum Pro Hyperion also holds tension remarkably well, offering a very high level of control and is among the most durable poly-based strings we have playtested to date. The unique diamond-black color looks great on nearly every racquet. Hyperion is part of the new Blackline series from Signum Pro destined to deliver high dynamic power co-poly strings with exceptional tension maintenance. Free shipping on reels! Order a reel by Friday August 14th and receive 100 bonus gold points!